NEW DELHI, India (CNN) -- Indian police swiftly handled a "security scare" at New Delhi's major airport early Friday amid heightened concern in the wake of last week's terror attack in which gunmen killed 179 people in Mumbai. An Indian soldier joins the beefed up security detail at New Delhi airport. New Delhi police spokesman Rajan Bhagat said police responded to reports of gunfire at Indira Gandhi International Airport but found no casualties or damage. Bhagat said there was "no terror threat." "And there's no cause of panic," he added. Uday Banerjee, the head of India's Central Industrial Security Force, told reporters at the airport that something sounding like gunshots was heard, but no one saw anything and no bullet casings were found. Indian authorities stepped up security at the nation's airports on Thursday after receiving intelligence reports that terrorists might be planning an air attack. Police beefed up security at all airports including in the capital New Delhi, Mumbai, Chennai and Bangalore, Chakraborty said. The Press Trust of India, a nonprofit newspaper cooperative, said that reports had suggested that terrorists could have sneaked into the country to carry out strikes on the anniversary of the Babri mosque demolition. The mosque -- one of the largest in the Uttar Pradesh state -- was destroyed on December 6, 1992, by Hindu nationalists who believe it was built on the site of an existing temple. On Wednesday India's defense minister met with the chiefs of the army, air force and navy and discussed what the ministry in a news statement called "possible terror threats from air." The officials also discussed the country's coastal security plans and how to tighten security along the military line of control dividing the disputed region of Kashmir between India and Pakistan to "prevent infiltration of terrorists," the statement said. 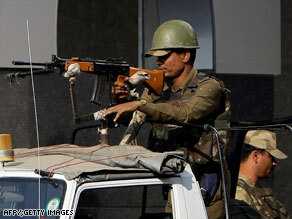 India ranks among the countries where terrorism is most common, according to the U.S. State Department. CNN's Harmeet Shah Singh and Sara Sidner contributed to this report.